Posted on March 30, 2010	by Lou Murray, Ph.D. I can no longer reach the top of the peas. That's some vigorous growth! Someone needs to tell my Super Sugar Snap Peas enough, already. I keep putting up taller and taller trellises and they keep outgrowing them. 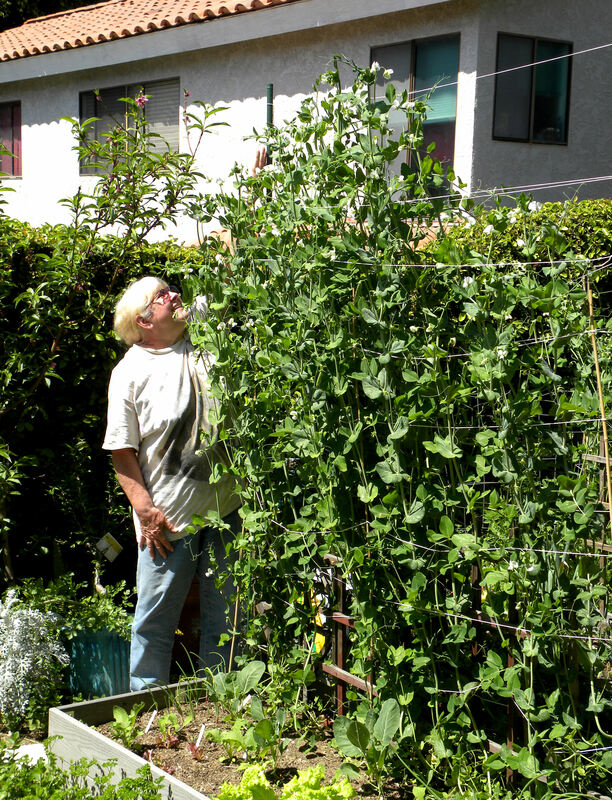 My 6-ft-tall husband drove 8 ft stakes into the raised beds, tied a string to top, and the peas are now 6″ taller than that string. It’s really getting to be ridiculous. I can’t reach the top peas to harvest them. Note to self. Don’t plant this variety of peas in a raised bed again. 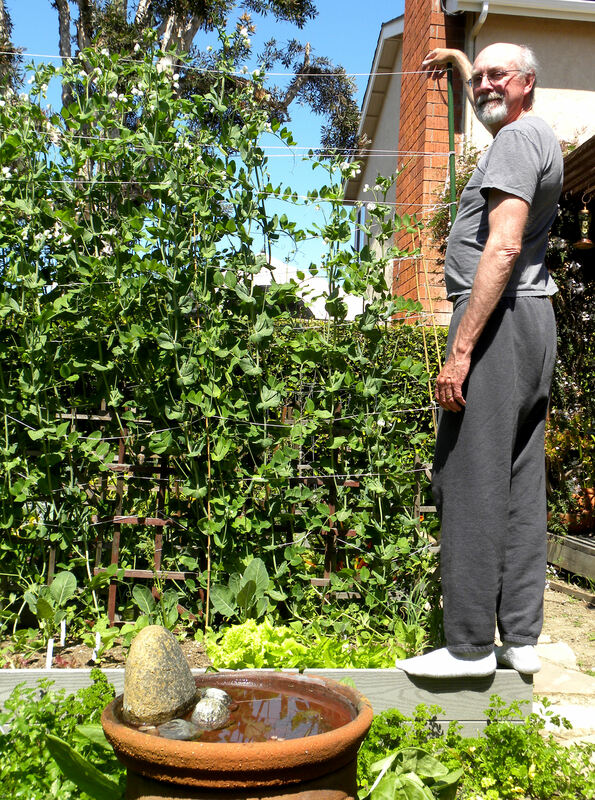 Even 6-ft-tall Vic has to stand on something to reach the top of the peas. Well, at least something grows in my garden. After crop failures of my cabbages, it’s nice to see such lush growth. It isn’t all vine. They’re making peas too. One day's harvest included these lovely leeks, as well as makings for a stirfry and salad. Here’s the harvest for this week. 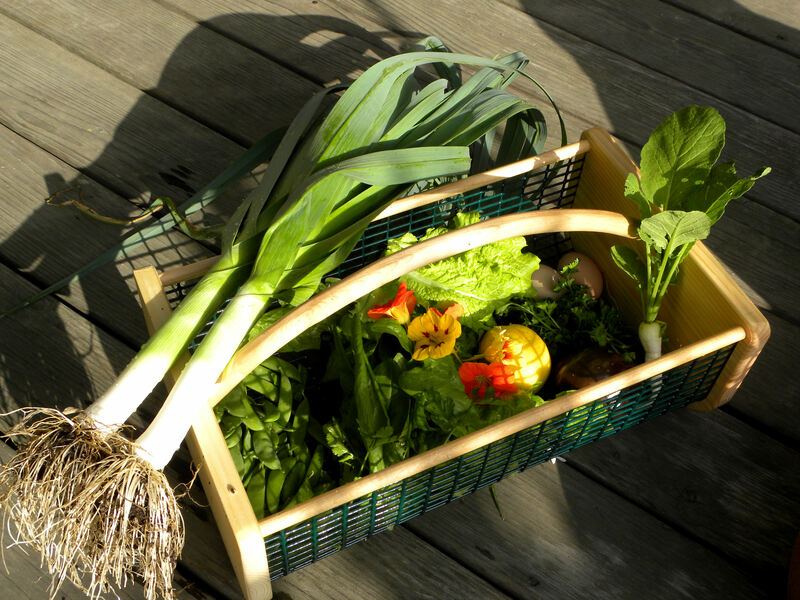 If you had a harvest this week, visit Daphne’s Dandelions and post your results! It must be the year. I’ve seen other blogs where the sugar snap peas are just as vigorous this year. I can think of worse things than too-tall peas! The growing conditions are certainly agreeing with them. Oh I have to laugh. I grew that variety last year too. I just chopped them off at 6′. I couldn’t make my trellis bigger and they were shading the squash. So they got chopped. This year I’m only growing peas that say 2 1/2-3′. I’m really hoping to keep them under control. Nice snaps. My peas always seem to manage to overgrow their trellis and expected size. Someone was writing on another site about how it may have something to do with latitude or maybe soil or who knows! What kind are they? It’s nice that they are so vigorous, which variety of sugar snap is it? Do you like the shoots, they are delicious. Oh wow, what beautiful pea vines. I would love to be harvesting some snap peas now, my overwintered vines were not happy so I pulled them and replanted, it’s going to be awhile. Are the Super Sugar Snaps resistant to powdery mildew? I’m very impressed! I love peas, and not imagine that it’s ever possible to have too many. Although reaching them might be a challenge with your tall plants! That harvest looks tasty! Those peas are pretty huge. I am trying an 8′ variety this year, if they live up to that I will need a ladder! Oh, those sugar snap peas do grow and grow! Do they make too much shade for other plants? I imagine they do. That’s why I grow all my vegetables in direction north – south, so tall plants don’t shade too much other. Hi Vrtlaricaana, Dan, Ottawa Gardener, Curbstone, Daphne, Turling, Villager, Michelle and Mac, thanks for stopping by. The peas are super sugar snap from Cook’s Garden. Because of the position of the sun and spacing of the beds, they’re not shading bed #2. Yet. The vines are vigorous for sure, but I’m wondering if I’ll even get two pounds of peas from them. Well, I’m certainly enjoying what I’m getting. At least something grows in my garden. I wonder if peas only grow that tall in California. hahaha. I’ve certainly never seen one that high here in New England. From the looks of things, your trellis has to be especially spring to handle that amount of weight. Hi Thomas. My trellis kept growing as the peas kept growing. I started out with a three-foot wooden trellis, added 6-ft bamboo poles in a rectangle around the peas and now the 8 ft plastic poles with string. They sway a lot in the breeze. Daphne grew some Super Sugar Snaps last year and cut them back at 6 ft, so my guess is that they’d grow that big for you too.